To do any serious work to your bike, a stable and adjustable work stand is imperative. A high quality work stand will bring the moving parts of the bike up to eye level, enabling you to turn the cranks on the bicycle without it going anywhere. This will make it possible for you to perform a variety of tasks much more effectively, from aligning your brakes to changing your bottom bracket, to adjusting your gears and more. 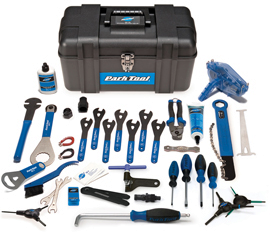 The basic tool kit should consist of Allen Keys, a Phillips screwdriver and an adjustable spanner, but as you start to improve your bike maintenance skills you will need more tools, many of them bicycle-specific. Doing a Cytech course is the best way of learning these skills and learning which tool is the correct one for each job. Because the majority of bicycles have a completely external drivetrain, they are very exposed to the elements compared to other methods of transportation. To keep them running smoothly and efficiently, bicycles require regular cleaning and relubrication. 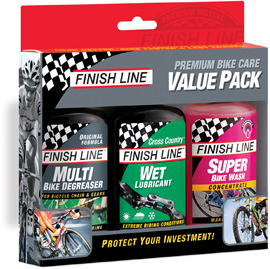 There are a variety of bicycle-specific cleaners, degreasers and lubricants available in specialist bike shops that can keep your pride and joy looking and riding beautifully when used correctly. 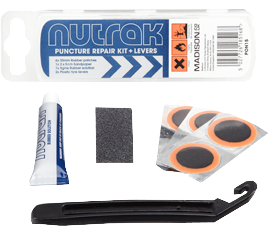 A typical kit consists of patches, glue, chalk and sandpaper for better adhesion. Taking the time to patch old tubes can drastically increase their lifespan if done well. See the bike care section for more information on tyres, valves and how to repair a puncture. A compact hand pump may be sufficient to get you home, but once you get there it is much easier to keep your tyres inflated with a proper track pump. A good quality track pump will get your tyres up to the recommended pressure in a matter of seconds and with minimal effort. Track pumps also have the advantage of an accurate pressure gauge, so you can be sure your tyres are safe to ride, reducing the risk of pinch punctures or rim/tyre blowouts. Certain components on your bicycle are consumable, and should be thought of such. Parts like cables, brake pads and rims can all be inspected with a simple visual or functional test. The same is unfortunately not true of your drivetrain components. A chain checker will allow you to keep on top of your chain wear, which in turn will help to minimise wear to other more expensive drivetrain components. Typically, if a bicycle chain is replaced before reaching around 0.75% elongation, the rider can continue to use the same cassette and chainrings trouble-free.